Happy book birthday to Rose’s Dress of Dreams! 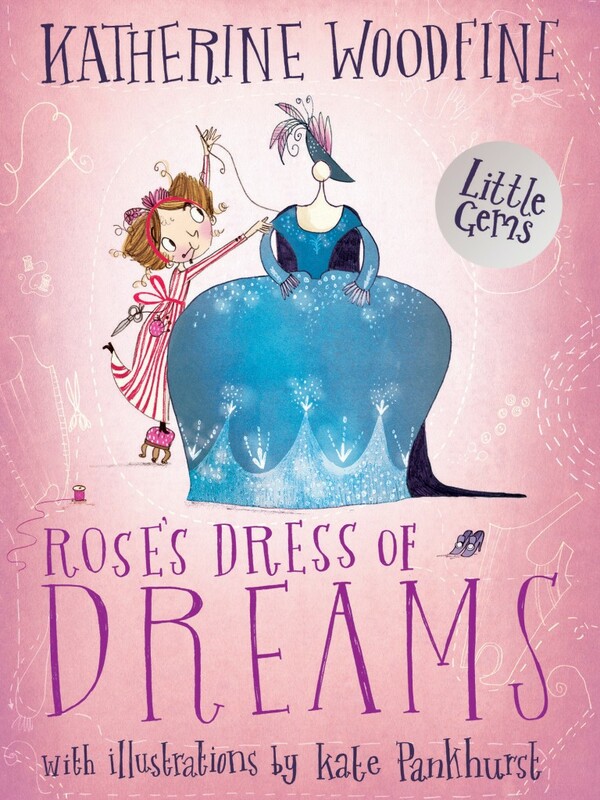 My brand new book Rose’s Dress of Dreams is now out in the world – and I couldn’t be more delighted! I’ve had such a wonderful time working with incredible illustrator Kate Pankhurst and the team at publisher Barrington Stoke on this book for the super-readable Little Gems series. 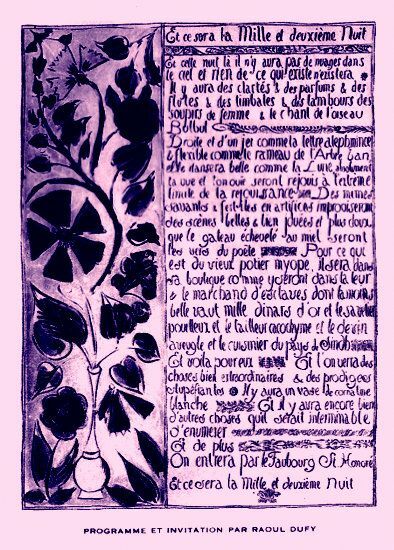 Young Rose dreams of sewing stunning dresses for the women of Paris. But when a chance encounter with royalty changes her life, Rose must draw on all her skills to create the most breathtaking dress of them all. 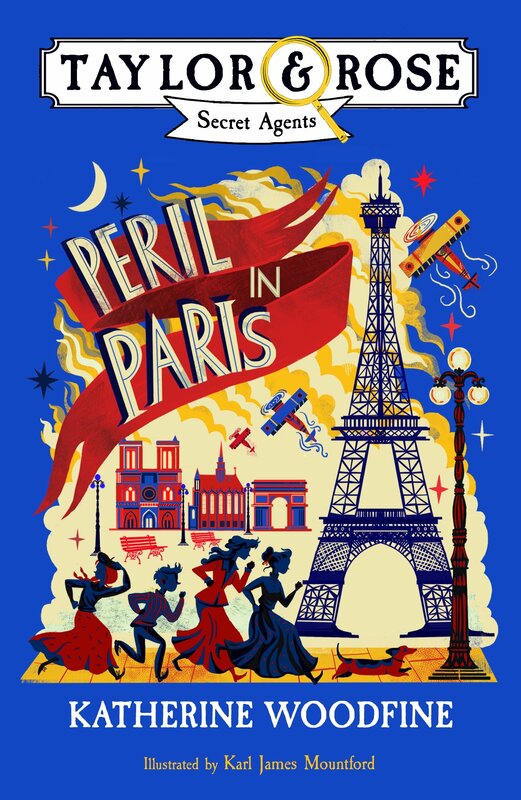 Inspired by the life of Rose Bertin, the woman credited with inventing haute-couture, this is a story to inspire bold girls and boys everywhere. You can also of course check out my Rose’s Dress of Dreams Pinterest board, which is crammed with gorgeous images that helped inspire the story. 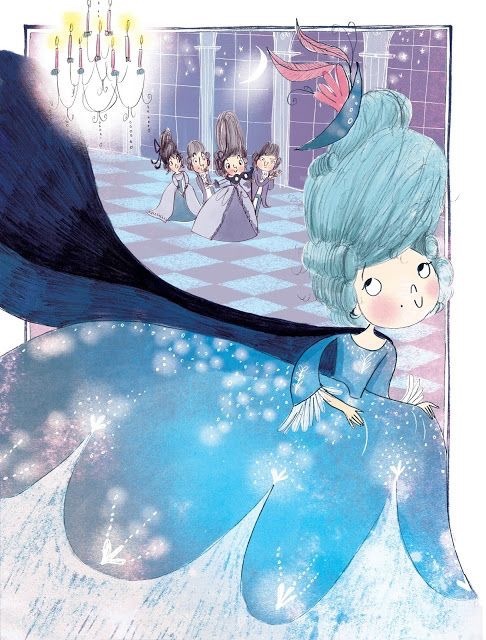 I’m especially thrilled that Rose’s Dress of Dreams has been selected by Children’s Books Ireland to be part of their fabulous Bold Girls project, celebrating the centenary of women’s suffrage in Ireland. Bold Girls is highlighting and reviewing books that feature strong, intelligent, self-possessed female protagonists in children’s books – and their Reading Guide features both Rose’s Dress of Dreams, and the anthology Make More Noise! The reading guide is crammed full of loads of brilliant book recommendations, and also celebrates twenty female Irish authors and illustrators, both emerging and established, who have made an exceptional contribution to the canon of Irish children’s literature. You can download it here – as well as lots of other material such as classroom resources and a beautiful poster. 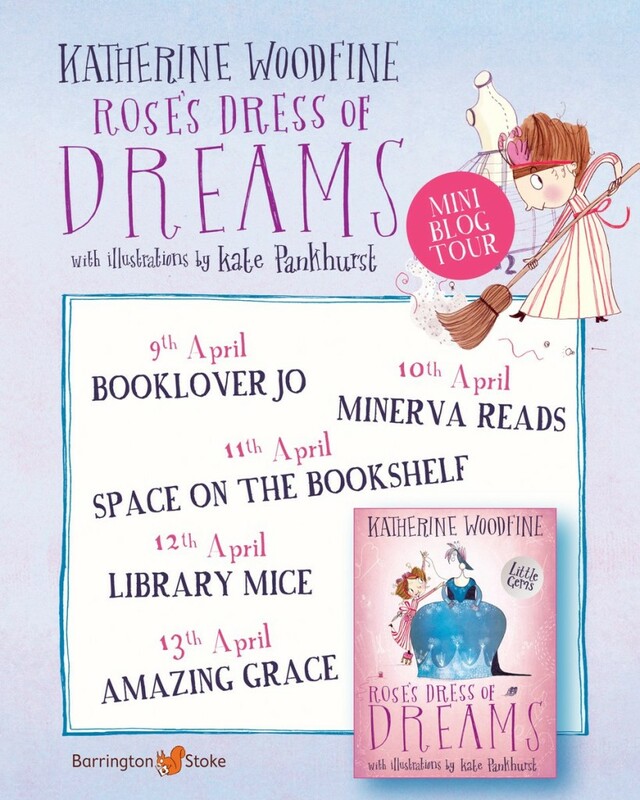 To celebrate the publication of Rose’s Dress of Dreams, I also wrote this piece for them about why I think Rose is a brilliant example of a ‘bold girl’! Finally for publication week, Barrington Stoke organised a lovely celebration of Rose at the London Book Fair – complete with a special chocolate cake. Sadly I couldn’t go as I was at home with tonsilitis (feeling very sorry for myself!) but I’m so pleased that everyone was there to wish Rose well – and I’m looking forward to more celebrations very soon! Regular readers will know that my Behind the Scenes series explores some of the background to my Sinclair’s Mysteries books. I’ve written about everything from the real-life Edwardian department stores that inspired my fictional Sinclair’s, to 1900s gentlemen’s clubs, to the lives of Edwardian servants. 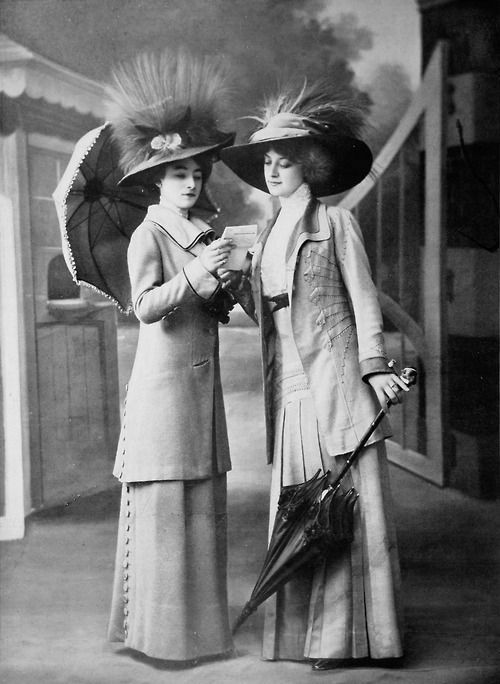 From a contemporary vantage point, the fashions of the Edwardian era were incredibly elaborate. Ladies of fashion decked themselves out in ornate gowns, requiring an array of undergarments beneath. Typically these would include ‘combinations’ (a kind of vest and knee-length bloomers all-in-one), a corset or stays, and in some cases, silk pads on the hips to help create an exaggerated body-shape. Over this would be worn a lace-trimmed camisole, silk stockings and petticoats, and then finally the gown itself – often decorated with lace, embroidery, ruffles, frills and flounces. Being an Edwardian lady required constant outfit changes (‘a large fraction of our time was spent in changing our clothes’ said Cynthia Asquith). There were different styles for every possible occasion – day dresses, evening dresses, walking dresses, riding habits, ball gowns, the fashionable new ‘tea gowns’ which were supposed to be worn whilst lounging in the boudoir enjoying afternoon tea, and many more. 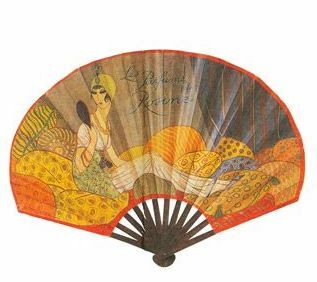 There were also a huge variety of accessories; as well as enormous wide-brimmed hats decorated with feathers, bows and artificial flowers, these would include gloves, parasols, jewels, fans, handbags and a range of outerwear – mantles, jackets, boleros, pelisses, and furs. 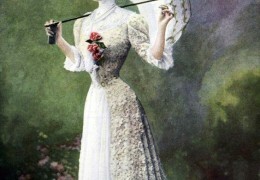 Paris was very much the fashion capital and wearing a Paris gown was considered the height of elegance. 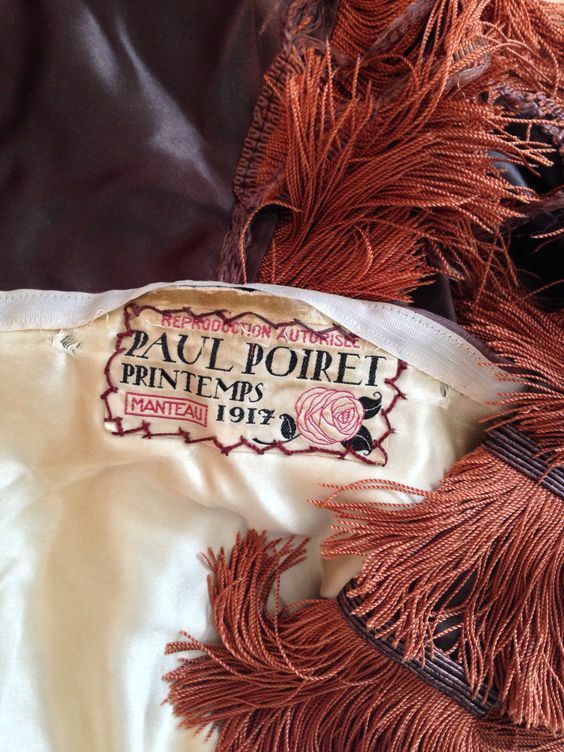 Wealthy London ladies might make special trips to Paris to have their fashionable dresses made by a top modiste. 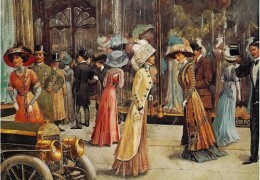 Alternatively, they might visit the grand salon of a British couturier (like the fictional Henrietta Beauville, who appears in The Midnight Peacock) to select their made-to-order gowns and have them fitted. However, new ‘ready-to-wear’ clothing was also becoming available, meaning that for the first time, people could buy their clothing off the rack in a shop (as most of us do today) rather than going to a dressmaker, or making it themselves at home. Even the very wealthy, who continued to have their clothes made for them by fashionable dressmakers, would visit grand department stores like Sinclair’s to purchase blouses, hats, stockings, or even the occasional dress. 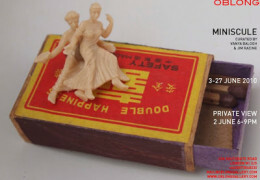 ‘A day’s shopping in Town’ became a very popular entertainment and ladies would enjoy shopping for items like scent-bottles, dressing-jackets trimmed with swansdown, chemises, and boudoir caps. 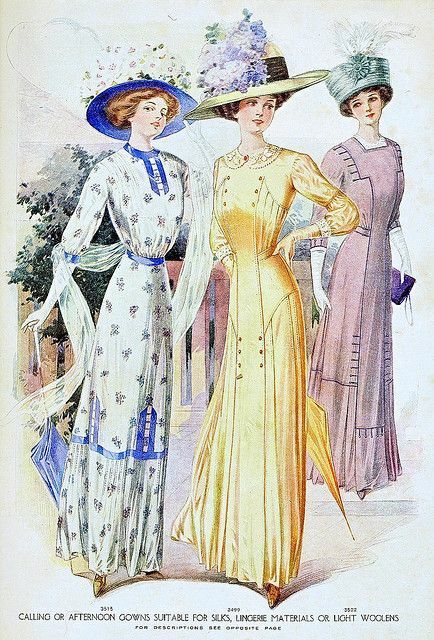 At first glance, Edwardian fashions may seem as elaborate as their Victorian predecessors – but in fact, from the 1890s onwards, it was beginning to go through a significant change. 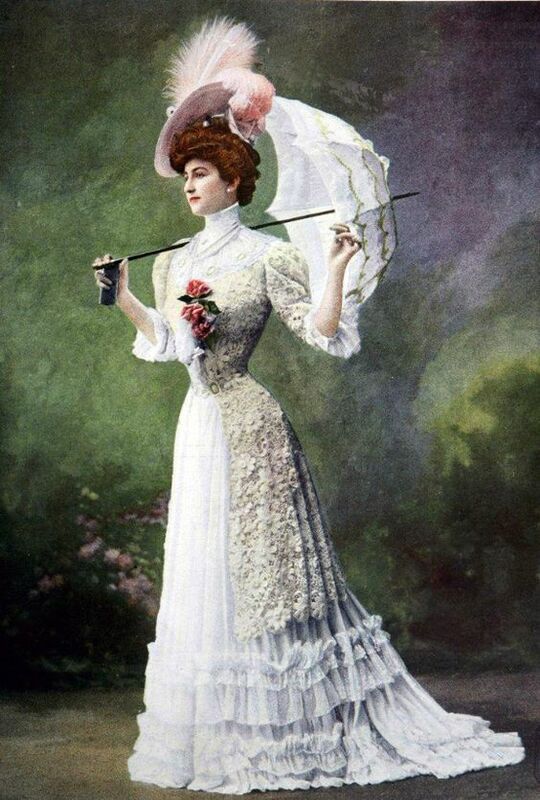 Silhouettes were shifting away from full skirts and bustles towards a slimmer silhouette – firstly the swan-like S-shape that was so popular in the 1900s, then the narrow ‘hobble skirt’ of the 1910s. What’s more, simple tailored suits (known as ‘tailor-mades’) were becoming popular for women, reflecting the changes to women’s lives. The so-called ‘New Woman’ of the period needed more practical clothing for work, study and an active lifestyle. In particular the vogue for cycling meant that adventurous young women began to experiment with wearing bloomers or knickerbockers. Motoring also required practical clothes such as tailored skirts and leather topcoats which would act as a protection from the weather. 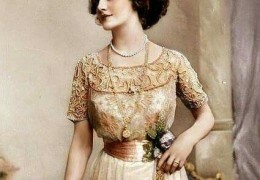 Styles also began to move away from the pastel, feminine ensembles of the turn-of-the-century. 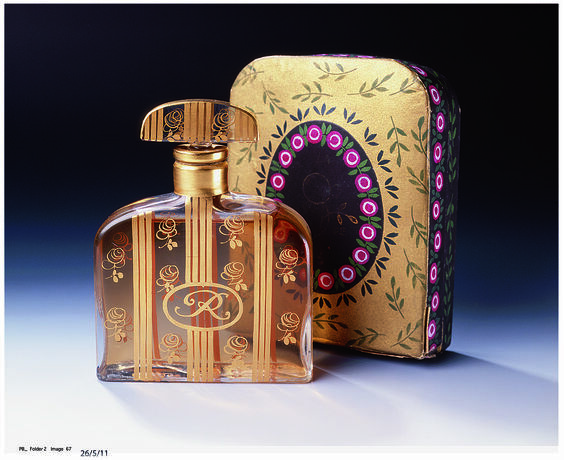 From 1909 onwards, the Ballet Russes had a huge influence on fashion, setting a trend for bolder colours and new less structured, more flowing shapes. 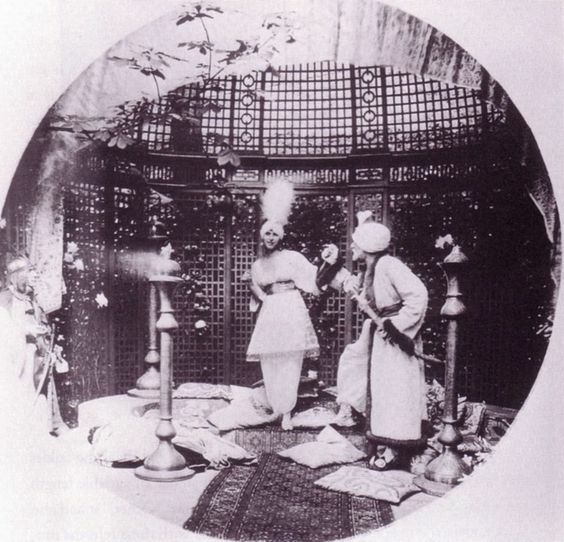 Empire lines, draped skirts, kimono sleeves, cloaks and turbans became popular. Some young women even wore pantaloons – though at first these styles were considered very daring and controverisal! 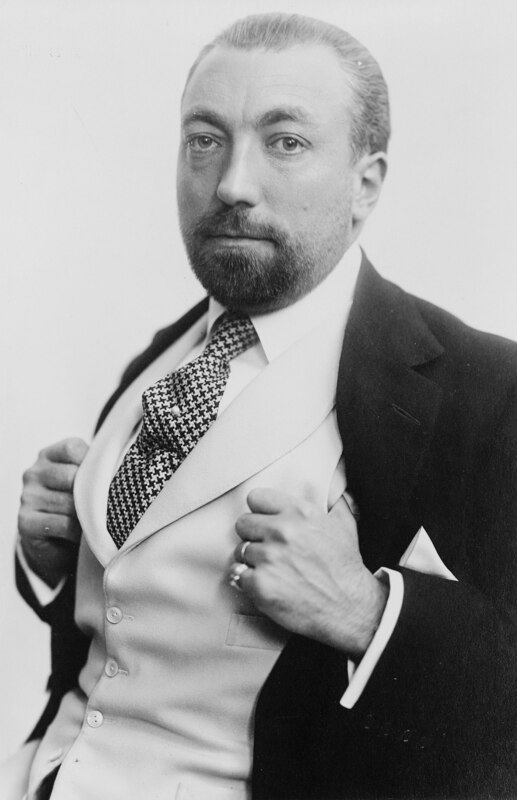 The French designer Paul Poiret had a particularly important influence on this style. In The Midnight Peacock, these new styles are very much in evidence at Mr Sinclair’s New Year’s Eve Ball. 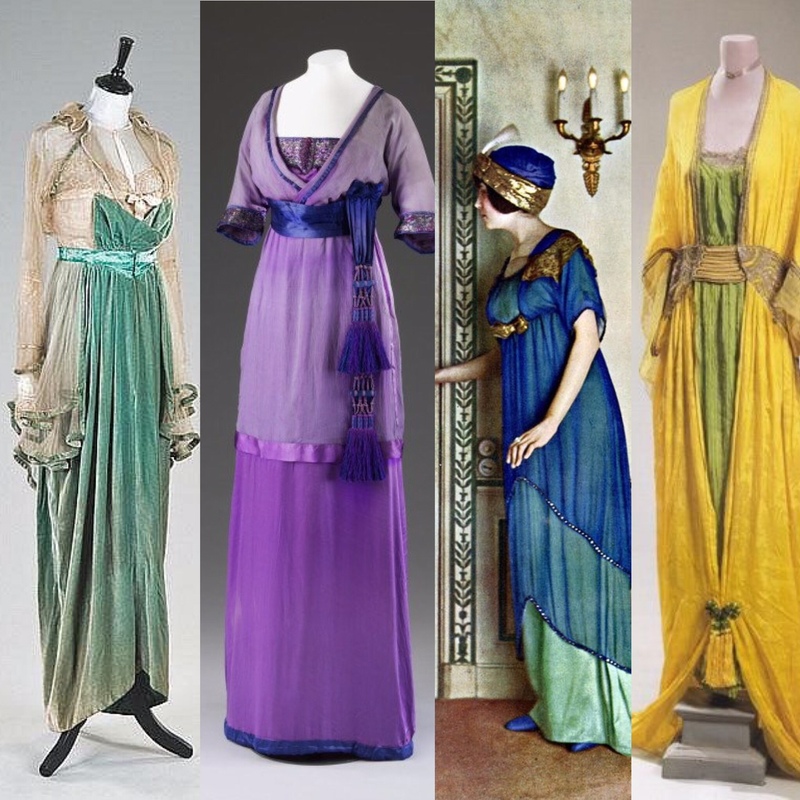 In this way, it’s clear that the styles of the 1900s and 1910s were beginning to pave the way for the bold flapper fashions which would soon follow in the 1920s. The pictures in this post all come via my trusty Edwardiana Pinterest board (click the image for the source) where you can also find lots more pictures of Edwardian fashions. 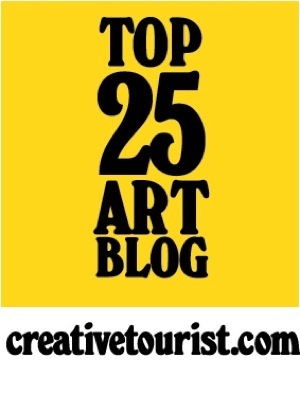 Stay tuned for some more fashion-themed posts to follow soon!